In 1934, American Airlines and the Air Transport Association simplified the process even more with the advent of the Air Travel Card. They created a numbering scheme that identified the Issuer of card as well as the Customer account. This is the reason the modern UATP cards still start with the number 1. With an Air Travel Card passengers could “buy now, and pay later” for a ticket against their credit and receive a fifteen percent discount at any of the accepting airlines. By the 1940s, all of the major domestic airlines offered Air Travel Cards that could be used on 17 different airlines. By 1941 about half of the Airlines Revenues came through the Air Travel Card agreement. The Airlines had also started offering installment plans to lure new travelers into the air. In October 1948 the Air Travel Card become the first inter-nationally valid Charge Card within all members of the International Air Transport Association. The concept of customers paying different merchants using the same card was expanded in 1950 by Ralph Schneider and Frank McNamara, founders of Diners Club, to consolidate multiple cards. The Diners Club, which was created partially through a merger with Dine and Sign, produced the first "general purpose" charge card, and required the entire bill to be paid with each statement. That was followed by Carte Blanche and in 1958 by American Express which created a worldwide credit card network (although these were initially charge cards that acquired credit card features after BankAmericard demonstrated the feasibility of the concept). However, until 1958, no one had been able to create a working revolving credit financial instrument issued by a third-party bank that was generally accepted by a large number of merchants (as opposed to merchant-issued revolving cards accepted by only a few merchants). A dozen experiments by small American banks had been attempted (and had failed). In September 1958, Bank of America launched the BankAmericard in Fresno, California. BankAmericard became the first successful recognizably modern credit card (although it underwent a troubled gestation during which its creator resigned), and with its overseas affiliates, eventually evolved into the Visa system. In 1966, the ancestor of MasterCard was born when a group of banks established Master Charge to compete with BankAmericard; it received a significant boost when Citibank merged its proprietary Everything Card (launched in 1967) into Master Charge in 1969. Early credit cards in the U.S., of which BankAmericard was the most prominent example, were mass produced and mass mailed unsolicited to bank customers who were thought to be good credit risks. But, “They have been mailed off to unemployables, drunks, narcotics addicts and to compulsive debtors, a process President Johnson’s Special Assistant Betty Furness found very like ‘giving sugar to diabetics’.” These mass mailings were known as "drops" in banking terminology, and were outlawed in 1970 due to the financial chaos they caused, but not before 100 million credit cards had been dropped into the U.S. population. After 1970, only credit card applications could be sent unsolicited in mass mailings. Credit cards are issued by a credit card issuer, such as a bank or credit union, after an account has been approved by the credit provider, after which cardholders can use it to make purchases at merchants accepting that card. 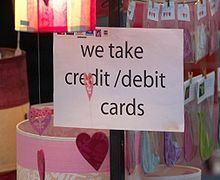 Merchants often advertise which cards they accept by displaying acceptance marks – generally derived from logos – or may communicate this orally, as in "We take (brands X, Y, and Z)" or "We don't take credit cards". Many credit cards offer rewards and benefits packages, such as offering enhanced product warranties at no cost, free loss/damage coverage on new purchases, and points which may be redeemed for cash, products, or airline tickets. Low introductory credit card rates are limited to a fixed term, usually between 6 and 12 months, after which a higher rate is charged. As all credit cards charge fees and interest, some customers become so indebted to their credit card provider that they are driven to bankruptcy. Some credit cards often levy a rate of 20 to 30 percent after a payment is missed. In other cases a fixed charge is levied without change to the interest rate. In some cases universal default may apply: the high default rate is applied to a card in good standing by missing a payment on an unrelated account from the same provider. This can lead to a snowball effect in which the consumer is drowned by unexpectedly high interest rates. Further, most card holder agreements enable the issuer to arbitrarily raise the interest rate for any reason they see fit. First Premier Bank at one point offered a credit card with a 79.9% interest rate, however they pulled the plug on this card in February of 2011 because of persistant defaults. Merchants are charged several fees for accepting credit cards. The merchant is usually charged a commission of around 1 to 3 percent of the value of each transaction paid for by credit card. The merchant may also pay a variable charge, called an interchange rate, for each transaction. In some instances of very low-value transactions, use of credit cards will significantly reduce the profit margin or cause the merchant to lose money on the transaction. Merchants with very low average transaction prices or very high average transaction prices are more averse to accepting credit cards. In some cases merchants may charge users a "credit card supplement", either a fixed amount or a percentage, for payment by credit card. This practice is prohibited by the credit card contracts in the United States, although the contracts allow the merchants to give discounts for cash payment. A prepaid credit card is not a true credit card, since no credit is offered by the card issuer: the card-holder spends money which has been "stored" via a prior deposit by the card-holder or someone else, such as a parent or employer. However, it carries a credit-card brand (such as Discover, Visa, MasterCard, American Express, or JCB etc.) and can be used in similar ways just as though it were a regular credit card. Unlike debit cards, prepaid credit cards generally do not require a PIN. 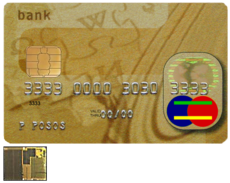 An exception are prepaid credit cards with an EMV chip. These cards do require a PIN if the payment is processed via Chip and PIN technology. After purchasing the card, the cardholder loads the account with any amount of money, up to the predetermined card limit and then uses the card to make purchases the same way as a typical credit card. Prepaid cards can be issued to minors (above 13) since there is no credit line involved. The main advantage over secured credit cards (see above section) is that you are not required to come up with $500 or more to open an account. With prepaid credit cards purchasers are not charged any interest but are often charged a purchasing fee plus monthly fees after an arbitrary time period. Many other fees also usually apply to a prepaid card. The Credit CARD Protection Act of 2009, that was signed into law by President Obama, requires that consumers "opt-in" to over-limit charges. Some card issuers have therefore commenced solicitations requesting customers to opt in to overlimit fees, presenting this as a benefit as it may avoid the possibility of a future transaction being declined. Other issuers have simply discontinued the practice of charging overlimit fees. Whether a customer opts in to the overlimit fee or not, banks will in practice have discretion as to whether they choose to authorize transactions above the credit limit or not. Of course, any approved over limit transactions will only result in an overlimit fee for those customers who have opted in to the fee. This legislation took effect on February 22, 2010. ^ Sullivan, arthur; Steven M. Sheffrin (2003). Economics: Principles in action. Upper Saddle River, New Jersey 07458: Pearson Prentice Hall. p. 261. ISBN 0-13-063085-3. http://www.pearsonschool.com/index.cfm?locator=PSZ3R9&PMDbSiteId=2781&PMDbSolutionId=6724&PMDbCategoryId=&PMDbProgramId=12881&level=4. ^ Schneider, Gary (2010). Electronic Commerce. Cambridge: Course Technology. p. 497. ISBN 0538469242. ^ "Credit card imprinter". Cultureandcommunication.org. http://cultureandcommunication.org/deadmedia/index.php/Credit_Card_Imprinter. Retrieved 2011-07-28. ^ Flying Magazine: 11. June 1953. ^ "FAQ's". UK Cards Association. 2005-01-01. http://www.theukcardsassociation.org.uk/misc/-/page/faqs/#question2. Retrieved 2011-07-28. ^ Prater, Connie (2010-04-07). "Issuer of 79.9% interest rate credit card defends its product". FoxBusiness.com. http://www.foxbusiness.com/personal-finance/2009/12/18/issuer-rate-credit-card-defends-product/. Retrieved 2011-07-28. ^ Didier, Paul (2011-03-04). "The worst credit card in America is dead!". Debt800.com. http://www.debt800.com/news/news34.html. Retrieved 2011-08-23. ^ Carr, Ted (2010-09-02). "Minimizing Confusion Over Minimums". Blog.visa.com. http://blog.visa.com/2010/09/02/minimizing-confusion-over-minimums/. Retrieved 2011-07-28. ^ "Example of a supplement chargeable to the customer when paying by credit card". Bmibaby.com. 2011-01-05. http://www.bmibaby.com/bmibaby/terms_and_conditions/our_top_booking_tips,_baby/fees_and_charges.aspx. Retrieved 2011-07-28. ^ "Comparison of exchange rates using Visa and Diners Club cards in Bali". Lonelyplanet.com. 2010-03-03. http://www.lonelyplanet.com/tonywheeler/my_lists/why_we_cut_up_our_credit_cards/. Retrieved 2011-07-28. ^ "This is Money Card charges to be slashed". Thisismoney.co.uk. 2006-03-13. http://www.thisismoney.co.uk/credit-and-loans/article.html?in_article_id=407583&in_page_id=9. Retrieved 2011-07-28. ^ "Current credit card default charges unfair". Oft.gov.uk. http://www.oft.gov.uk/news/press/2006/68-06. Retrieved 2011-07-28. ^ Joseph S. Enoch. "Credit Card Executives Tough Out Senate Hearing". Consumeraffairs.com. http://www.consumeraffairs.com/news04/2007/03/senate_credit_cards02.html. Retrieved 2011-07-28. ^ "Statutory Instrument 1990 No. 2159: The Credit Cards (Price Discrimination) Order 1990". Opsi.gov.uk. http://www.opsi.gov.uk/si/si1990/Uksi_19902159_en_1.htm. Retrieved 2011-07-28. ^ American FactFinder, United States Census Bureau. "US Census: 2005–2007 American Community Survey 3-Year Estimates". Factfinder.census.gov. http://factfinder.census.gov/servlet/STTable?_bm=y&-geo_id=01000US&-qr_name=ACS_2007_3YR_G00_S0101&-ds_name=ACS_2007_3YR_G00_. Retrieved 2011-07-28. ^ "Experian's National Score Index". Nationalscoreindex.com. http://www.nationalscoreindex.com/ViewAllGraphs.aspx. Retrieved 2011-07-28. ^ "Prime Numbers: The Plastic Revolution". Foreign Policy. 2008-02-19. http://www.foreignpolicy.com/story/cms.php?story_id=4207. Retrieved 2011-07-28. ^ "A start-up's true tale". Pdp10.nocrew.org. http://pdp10.nocrew.org/docs/cisco.html. Retrieved 2011-07-28. This page was last modified on 19 December 2011 at 09:17.